Let me start by saying that I was a huge fan from the previous Fear Effects on the original Playstation. The unique mix between an adult story, stealth and the sweet visuals was so awesome back in the days. I was extremely excited to see Hana and Rain again, two girls that made a lasting impression on my life. And one of the first games to openly use bisexual characters. Did the French developer Sushee bring back Fear effect in a good way? Find out in this review! The best thing that Sedna has to offer are the really fun puzzles, some require trial and error but most are solvable in some really clever ways. Hints in the environments or some logical solutions, one thing is for sure I had to use my brains and that has been a while that a game forced me to do that. One puzzle took me almost half an hour but the satisfaction after finally solving it was awesome. One of the strongest points from the previous Fear Effects was without a doubt the characters. The cast in Sedna still remains special and interesting, they lost a little magic because of some weird voice acting but the interaction and story around Hana and Rain are still good enough. And most importantly, developer Sushee respected and learned from the previous games. The level structure and story make Sedna original and fun to play. You never have to do some repetitive stuff, you solve puzzles, serve people some Champagne and gather intelligence, move around in stealth, battle challenging boss fights and kinda learn to love all the characters. The idea from the tactical mechanic to stop time and move around is nice on paper but totally unnecessary. I honestly never used it that much. The combat just wasn’t designed for it, besides the fact that the developer spend time on this feature it doesn’t have a negative impact on gameplay. Maybe they should have used this time to polish the game a little bit more though. Visually Sedna is a very mixed experience, the comic-like dialogue are beautiful and the cut scenes, especially the cut scenes were you die, are well made. Characters are accurate and well designed but the generic environments miss that known Fear Effect sense. Some levels are a chore to walk through, and offer little to no reason to explore. You have secret totems that unlock concept art but that wasn’t really a motivation to run around all spots. Characters are likable but the voice actors are truly some laughable performances. I thought that the recent game Past Cure had the crown for worse voice acting but Fear Effect Sedna doubles that. Hana and Rain are barely okay but all other voices are simply not good enough. I hate to point someone out in particular, but Deke had some real cringe-moments. Stealth gameplay in general is simply broken. Enemy AI and behavior don’t work with some stealth sections. Not being able to move around dead bodies is another huge missed opportunity. The fear for getting stuck in stealth exists too, I remained stuck in the crouch position three times, forcing me to restart the level. 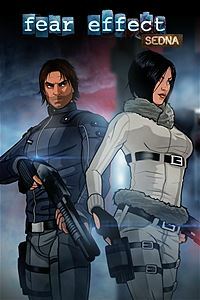 Fear Effect Sedna [Score: 7,6/10] Developer Sushee did a decent attempt to revive Fear Effect. It doesn’t reach the same epicness from the previous two games but Sedna is an enjoyable game with a few flaws. People who loved the franchise and puzzle lovers should definitely check this game out.